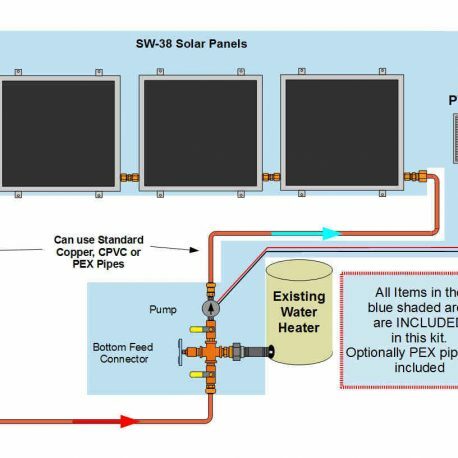 Our 3 Panel SW-38 Solar Water Heating Kit comes with all the parts needed to install your solar water heater system on your house or cabin. As with all our systems they connect directly to your existing water heater and don’t interfere with existing source of heat (gas or electric). This way you can enjoy hot water even during long cloudy periods. 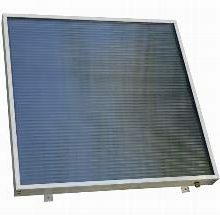 Using our newly designed SW-38 Solar Water Heater panels you can simply thread the panels together. No more external connection pipes for multi panel installations! Each panel weighs slightly over 14 lbs. and is 24″ by 24″ but can still provide you with ample hot water. You can begin your system with a few panels and add more if you need more. With this kit you DO NOT have to solder at all! 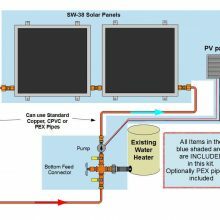 Our 2 Panel GH Solar Water Heating Kit allows you to install your solar water heater system in record time. The GH System uses a Stainless Steel Heat Exchanger with a special food grade heat transfer fluid (DOWFROST) to create a system that can operate trouble free year round. Please use our Glycol Calculator to determine the dilution ratio for winter conditions in your area as well as the total amount of glycol concentrate you need (2 Quarts are included). 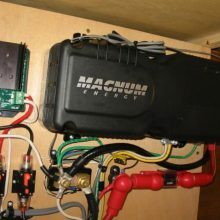 As with all our systems they connect directly to your existing water heater and don't interfere with existing source of heat (gas or electric). This way you can enjoy hot water even during long cloudy periods. 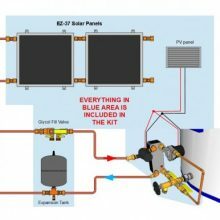 Using our revolutionary EZ-Connect Solar Water Heater panels you can simply thread the panels together. No more external connection pipes for multi panel installations! Each panel weighs slightly over 12 lbs. and is 24" by 24" but can still provide you with ample hot water. 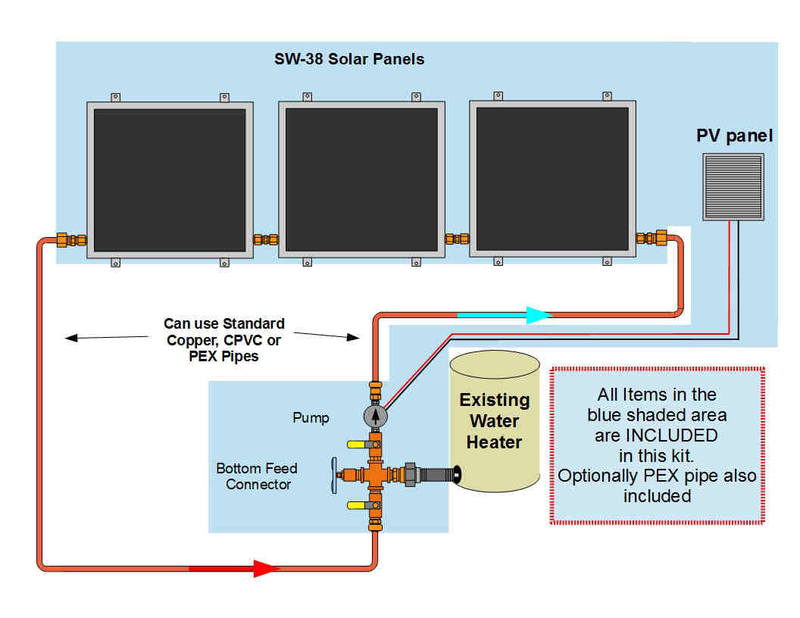 You can begin your system with a few panels and add more if you need more. With this kit you DO NOT have to solder at all!